In celebration of Mother’s Day May 8th, we’re highlighting luxury watch brands this week founded by women. Bédat & Co, is the quintessential watch brand for women, established in 1996 by watchmaker Simone Bédat to produce distinctively feminine timepieces for women. Not only is Bédat & Co.founded by women, all of the watches in this prestigious brand’s assortment are made expressly for women. 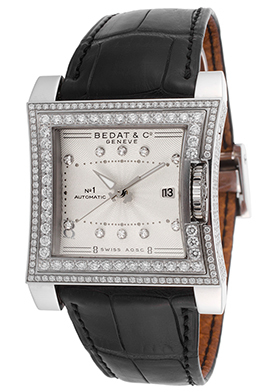 Bedat sought out to create premium crafted timepieces for women with exceptional feminine appeal and sensibilities in an industry that normally offered smaller-scale men’s watch styles to the female market at the time. Each Bédat watch is crafted in Switzerland and the brand was one of the first watchmakers to feature premium quality Wesselton diamonds in their timepiece collections. The Bédat & Co. No. 1 Automatic diamond watch is an extraordinary Mother’s Day choice. This exquisitely crafted women’s watch features brilliant, premium-grade round cut diamonds pave-set to glowing perfection on the bezel and case sides. The contoured square case in stainless steel is highly-polished to a mirror-bright patina. The supple black alligator strap with a deployment clasp closure adds to the luxurious good looks. The widescreen silver guilloche dial shines with luminous sword hands, ten sparkling diamond hour markers and an automatic date window. Features include a scratch-resistant sapphire crystal above the dial, precision Swiss-made automatic movement inside and water-resistance to 50 meters. Bédat & Co. watch is 30mm wide and 10mm thick. 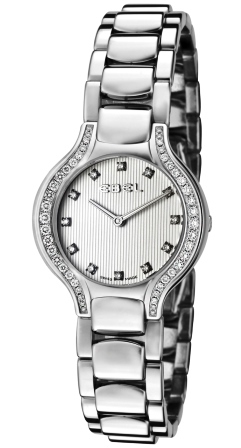 Ebel watches have been a Mother’s Day gift favorite for decades. The brand was founded in 1911 by Alice Levy and her husband Eugene Blum. The two pioneered many milestones in watchmaking history, including the strap wrist watch in 1912 and the diamond jewelry watch ring in 1914. The Blum’s children and grandchildren have carried on the brand’s tradition of time-keeping excellence. These exemplary standards are currently presented in the Ebel Mini Classic Wave diamond watch for women. Dazzling and diminutive in size, this exquisitely crafted timepiece features 30 round-cut diamonds, pave-set on the perfectly round bezel. The contoured case in brushed and polished stainless steel is presented on the signature wave bracelet in lustrous stainless steel, with a polished mirror-bright finish. The iridescent Mother-of-Pearl dial shines with polished silver-tone hands, Roman numeral half-hour markers and 10 sparkling diamond hour markers. Features include a scratch resistant-sapphire crystal above the dial, premium Swiss-made quartz movement inside and water-resistance to 30 meters. 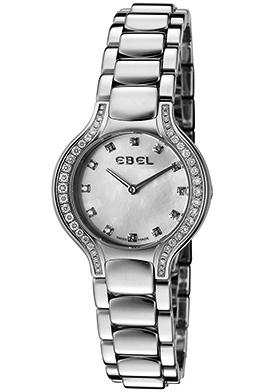 Ebel women’s watch is 27mm in diameter and 7mm thick. Although legendary fashion designer Coco Chanel did not parent any children she is certainly considered the Mother of fashion creations for her numerous fashion innovations. In the 1920’s Chanel introduced men’s trousers in her women’s sportswear collection. A fashion first at a time when women were delegated to wearing skirts and dresses. Chanel is also known for introducing the Little Black Dress” in her early collections during the 1920’s as well. The original, a sheath cocktail dress with long sleeves and tailored in silk and crepe de chine is still popular today in its many updated versions, almost a century later. The designer is also responsible for making a costume jewelry a fashion mainstay too. In the early 2000’s the Chanel brand made lustrous ceramic wristwatches a fashion must-have with the introduction of the J-Series diamond ceramic watches. 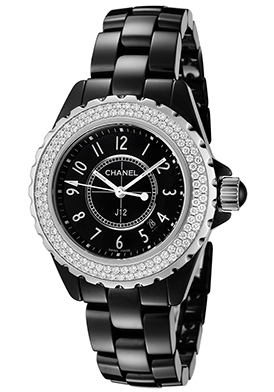 Lustrous and glowing with radiance, the Chanel J-12 women’s watch is pure glamour on the wrist. Two rows of shimmering round-cut diamonds cast a magical glow on the round bezel with a v-notched edged rim. The high-tech black ceramic case and bracelet are lustrous and alluring. The black dial shines with luminous hands and Arabic numeral hour markers. Features include a scratch-resistant sapphire crystal above the dial, along with a locking screw-down crown and case back for water resistance to 200 meters. Chanel watch is 33mm in diameter, 11mm thick and features quality Swiss-made quartz movement inside. Glendale Arizona is the place to be this weekend with Super Bowl XLIX taking place at the University of Phoenix Stadium. Over 111.5 viewers across the nation watched the big game last year between the Seattle Seahawks and Denver Broncos and an equal if not greater amount of viewers is expected for this year’s match-up between the Seahawks and New England Patriots on Sunday at 6:30 pm EST. There is much dialog taking place regarding the outcome of the game and if Seattle will have its second consecutive win in a row, joining the Pittsburgh Steelers, San Francisco 49ers, Denver Broncos, Green Bay Packers, Miami Dolphins and the Patriots in back-to-back consecutive Super Bowl wins. There is also much discussion about who will be named the Most Valuable Player of the big game on Sunday night. Quarterbacks tend to take the esteemed title and New England’s quarterback Tom Brady was named Super Bowl MVP in two of the three Super Bowls he has won. Seattle quarterback Russell Wilson was bested last year by teammate and linebacker Malcolm Smith for the MVP title. If Wilson is named Most Valuable Player this year, it will be his first MVP award. Brady is currently in the company of Pittsburgh Steeler quarterback Terry Bradshaw and New York Giant quarterback Eli Manning, who have also won two Super Bowl MVP awards. San Francisco 49er and Kansas City Chief quarterback Joe Montana is the only NFL player with three Super Bowl MVP awards. You’ll find many MVP timepieces at luxury retailer TheWatchery.com during their Super Swiss-Made Style event taking place this week. Many of today’s most prestigious and valuable timepieces for men and women from Rolex, Breitling, Ebel, Maurice Lacroix, Raymond Weil, Bell & Ross, Corum, Edox, Oris and Perrelet are featured in the promotion. The Ebel Brasilia Automatic chronograph is a real eye-opener. This outstanding men’s timepiece features a rectangular shape case in brushed and polished premium-grade stainless steel, presented on a high-performance black rubber strap with distinctive raised detail on the center panel. The highly legible black dial shines with three subdials, luminous hands and hour markers. Features include an automatic date calendar, small-second, 30-minute and 12-hour registers. Premium Swiss-made automatic movement assures you of precise time-keeping accuracy. Chronograph is 38mm wide, 13mm thick and is water-resistant to 50 meters or 165 feet. Valentine’s Day is a month away and there is no better time than now to select the perfect gift for the special person in your life. The holiday evolved to one of romantic love in 18th Century England, where lovers expressed their adoration for each other by bestowing flowers and candy, as well as sending greeting cards, which were known as Valentines. Today, Valentine’s Day ranks as one of biggest holidays of the year in consumer sales, ranking third behind Christmas and Mother’s Day. Last year, Americans spent over $18 billion on Valentine’s Day, mostly on flowers, candy and jewelry. While and candy are always good choices, a fine piece of jewelry such as a wristwatch is always an excellent choice for your Valentine. In addition to being a practical and useful present, a timepiece is also a gift they will treasure and cherish this Valentine’s Day and future ones to come. You’ll find an exceptional array of timepieces for men and women at luxury retailer TheWatchery.com during their Time To Love Valentine’s Day gift promotion. Over 550 timepieces are featured in the month-long promotion, including styles from Invicta, Maurice Lacroix, Gucci, Swiss Legend, Chanel, Breitling, Ebel, Chopard, Michael Kors, TAG Heuer and Raymond Weil. The Ebel Beluga ladies’ diamond watch is an excellent choice. Graceful women’s timepiece features a contoured 26mm diameter case and intricate link bracelet in highly polished stainless steel. Forty-six shimmering round-cut diamonds, pave-set to glowing perfection dramatically adorn the bezel. The silver colored dial with a fluted patterned background shines with silver colored sword hands and twelve sparkling hour marker. Features include premium Swiss-made quartz movement inside and water-resistance to 50 meters. June is easily one of the most popular months for Wedding Anniversaries. More couples have tied the knot during the month of June than any other month in the calendar. The month has traditionally been the popular choice for decades and many attribute this to the fact that the weather is generally not to hot or too cold in June. In addition, schools are also out in June and it’s easier for friends and family to travel at this time. Diamonds are always a popular choice for wedding anniversary gifts. Whether you’re celebrating your first or fiftieth year together, nothing evokes the expression of your love more than the brilliance and allure of diamonds. You’ll find a spectacular array of exceptional diamond timepieces at luxury retailer The Watchery, during their Luxury Diamond Watch Event, featuring luxurious diamond wristwatches for men and women from the most prestigious watchmakers in the world, including Ebel, Fendi, Raymond Weil, Bvlgari, TAG Heuer, RADO, Perrelet, Bedat & Co., Renato, Jacques Leman, Movado, Swiss Legend, Elini Barokas, Concord, Longines, Chanel and more. 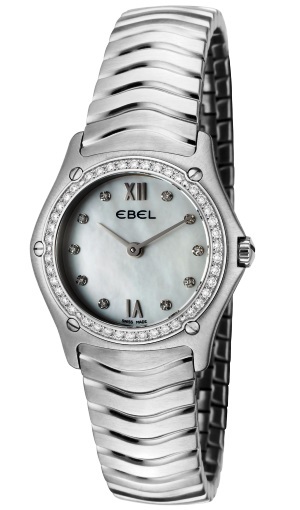 The Ebel Classic Wave Diamond timepiece for women is an excellent choice. This “mini” wristwatch features a diminutive stainless steel case that is 27mm in diameter, 7mm thick and is designed to comfortably embrace the most delicate of wrists. The case is beautifully integrated on the signature wave link bracelet in brushed and polished steel. Fifty- two shimmering, white round-cut diamonds, pave-set to glowing perfection, dramatically adorn the perfectly round bezel in highly polished stainless steel. The iridescent Mother-of-Pearl dial shines with polished silver-tone hands, ten sparkling inlaid diamond hour markers and raised silver-tone Roman numeral half-hour markers. Features include premium Swiss-made quartz movement inside and water-resistance to 30 meters or 100 feet. Complementary delivery is included on all domestic Diamond watch purchases at The Watchery. 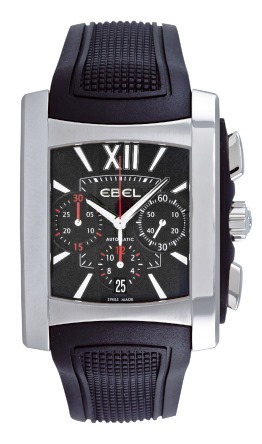 Premium Swiss watchmaker Ebel is a name synonymous with elegance, luxury and design since its founding in 1911. The brand was started by a husband and wife team, Eugene Blum and Alice Levy in La Chaux-de-Fonds, Switzerland. Ebel’s name comes from the initials of its founders: Eugene Blum et (and) Levy, who pioneered many milestones, including their strap wrist watch in 1912 and their diamond jewelry watch ring in 1914. During World War II from 1939 to 1945, Ebel supplied watches to the British Royal Air Force to assist pilots in their air missions throughout Europe. In 1970 the founder’s grandson Pierre Alain Blum took over the helm of the company, leading it to become the world-class watchmaker it is today. Under Blum’s direction in 1977, Ebel introduced the Sport Classic Collection for men and women featuring a rounded, hexagonal shaped case and distinctive wave length bracelet. The Sport Classic became an instant success and remains one of the most popular luxury watches for men and women today. In 1985, Ebel followed the Sport Classic with the Beluga collection, a lustrous and graceful collection of timepieces created expressly for women. With fluid, flowing contours and highly polished lines the Beluga was another international success. The Beluga became even more popular in 1999, when singer and entertainer Madonna wore one in print ads for Ebel, featuring just her henna-tattooed hand wearing a Beluga diamond model. Both the Sport Classic and Beluga collections remain popular today along with more recent introductions from Ebel, including the 1911, Tarawa and Brasilia series. All of these Ebel timepieces are available at prominent online retailer The Watchery. The Ebel Beluga diamond watch is pure enchantment… and with Mother’s Day just around the corner, it is an excellent choice for Mom. This glamorous timepiece features a contoured stainless steel case and distinctive steel link bracelet polished to a glowing patina. Forty-six shimmering, round-cut diamonds are prong-set to perfection on the bezel. Luminous Mother-of Pearl dial shines with polished silver tone hands and twelve diamond hour markers. Features include premium Swiss-made quartz movement and water-resistance to 50 meters or 165 feet.